Our customer was looking for a stamped concrete patio. The project included nearly 600 square feet of stamped concrete patio, sidewalk, and stoops. 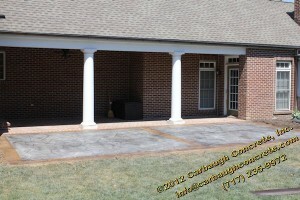 All of the concrete areas were stamped and the patio included a border. Our customer selected a flagstone pattern for his project. 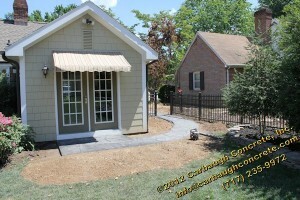 After visiting our office and seeing our patio, the customer selected to add the wood-grain border. The patterns used in this project included our Boardwalk Plank (used for the border on the patio) and Flagstone. The Flagstone pattern is a new stamp pattern for us this year. This project was the first project we have completed with this pattern and the results speak for themselves. 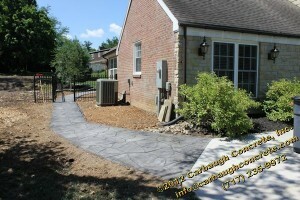 Contact us today to schedule a free estimate for your own Flagstone stamped concrete patio and sidewalk!